Is it just me, or does anybody else feel like May didn’t even happen?? Where did the month go?! This post is going up a few days later than anticipated, but it’s the end of the school year and this teacher is swamped! So ready for summer vacay! 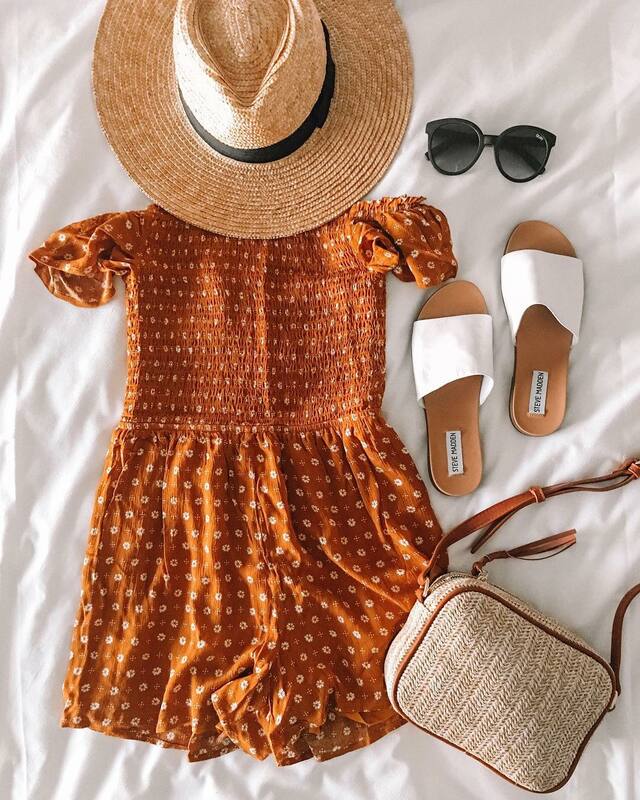 Shop May’s top ten items below…many of which are some of my top summer wardrobe picks! These sandals were also a top seller last month! I have been wearing these so much lately! They are super comfortable and go with everything. Plus, they are a dupe for a much pricier designer pair! If you haven’t picked up a pair of slide sandals for this spring and summer that should change! It’s my summer shoe essential! At just $20, this little t-shirt dress is a steal! I love the ruffled sleeves and of course the stripes! It’s the perfect little dress to wear in the classroom or on the weekends! I took this skort to Mexico and have worn it a few times since! I have been loving this color for summer and the polka dot print and ruffle add a flirty touch that I adore! I can’t wait to wear this on an upcoming date night! These knotted slide sandals come from one of my FAVORITE shoe brands, Soludos! They make the best summer shoes, and these are no exception! I love the color of these too…it goes with everything and can look a little dressier depending on how you style them! Plus they are under $100! 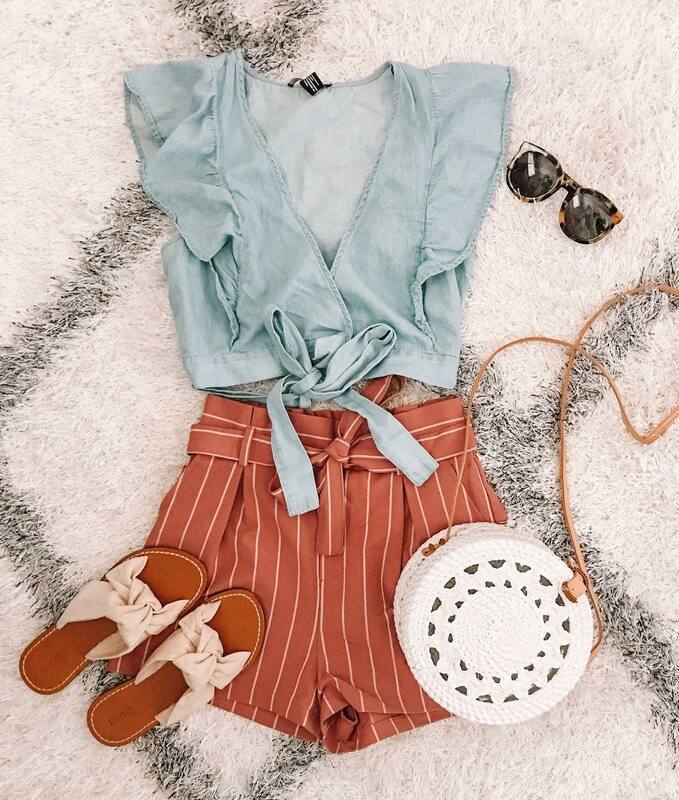 This top is linen, stripes and everything nice! From the flattering peplum fit to the adorable cutout detail in the back, this top screams summertime! I love pairing it with my Taudrey ‘Sweet Slide’ Necklace. This customizable necklace looks good with EVERYTHING! Get 10% off your purchase with code ASHLEY10. These pants!! This is their second month as a top seller! I shared these pants on the blog a few weeks ago. I’ve worn them on vacation and in the classroom. I love a piece that is comfy and versatile! What’s even better? That they are on sale for $30! This sweet little embroidered tank is what summer dreams are made of! It’s available in 3 colors and another fab sale find at under $30! Pairing it with another summer essential, my Clare V. bag! This smocked romper is coming to the blog soon, but it became a top seller after I posted this flatlay! I LOVE this color for summer, and the ditsy floral print is so cute! Bonus? It’s only $45! I’ve shared my love for this tank shift dress multiple times, including in this blog post. This dress is SO good! A comfy and classic piece that can be taken from the classroom to the weekend, which you know I love! This dress is available in 7 great colors, but this exact color is on sale for under $35!! This suit might be my favorite suit I’ve picked up this year. I LOVE the fit, the crochet detailing, the sweet tie top and the price tag! This exact suit combo is currently on sale for just $30! Hello, sweet summertime steal! Get the high waisted bottoms here and the tie top here. Check out the other combos for this suit here. Love your picks! I gotta have that stripped shorts. Nice dress, I like to have same kind of dresses. Aerie suits are seriously my favorite! They always have great new styles and the fit is always perfect! is there a link to shop picture #7? love it!